We've been a little upset about what one of our favorite princesses is being called. Everybody seems to think that he name is just Sleeping Beauty, but the true believers of the world know what her real name is. Aurora's story sounds pretty awesome to us. Most of the classic princesses had a pretty rough life. Belle was kidnapped, Cinderella was forced to clean up all the messes her stepsisters made, and Ariel had a very strict father. Aurora didn't have to worry about too much. Sure she didn't see her parents for a while, because of a curse placed on her, but she had three fairy godmothers who took care of her in an adorable little cottage in the woods. What about the whole curse, you ask? Well yes it did come true on her 16th birthday, but she didn't have to do too much there. She just fell asleep, and took a nice, long nap for a while. In the meantime, her prince was fighting a dragon, dodging goblins, and racing to her side. All she had to do was a quick little kiss to wake up. After that we're sure she lived happily ever after with that beautiful singing voice, ruling the castle with all the wisdom we could ever dream up. But who are we to tell you the rest of the story? Or really any of it? 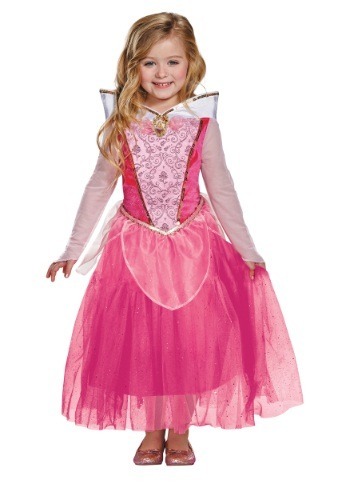 You're little girl can give you Aurora's side while dancing around the ballroom (or living room) in this officially license, deluxe costume. All she needs now is a tiara and a pair of matching shoes to make her own once upon a dream a reality. If you want your little one leaving a sparkling trail behind them, this is the one for you. Cute costume that is well made - stitches in place, Structured collar stays up. But since my kids wear their costumes for months before and after ... the mess of falling glitter won't work for us.